In The Exonerated, we meet six people found guilty of crimes they did not commit, left to count the days of their lives on death row. Perhaps the main thing they have in common is that they could be any one of us. The 2002 documentary play interweaves stories into kaleidoscopic variations on a theme. The University of Vermont Department of Theatre staged it with student and adult actors. The Exonerated eliminates one kind of suspense with its title but opens up a different uncertainty with its structure of true-life stories that should never have been true. The play answers how such things can happen; it's up to viewers to ponder how they can be prevented. In 2000, playwrights Jessica Blank and Erik Jensen interviewed 20 death-row inmates, then distilled six of their stories into first-person accounts. The play consists of authentic voices found through interviews, court transcripts and letters. The stories show how little it takes to produce a wrongful conviction in America: race, police interrogation techniques, must-win prosecutors, poverty, accident and investigative incompetence. Sunny Jacobs and her husband were convicted of killing two highway patrolmen. The actual killer retracted his false testimony a few years later, but Sunny's case wasn't reopened for another 13 years. Eighteen-year-old David Keaton was nowhere near the store where a man was killed, but he was found guilty of the crime. The evidence against Robert Earl Hayes and Delbert Tibbs amounted to the fact that they are black. After Gary Gauger discovered his father's dead body, police kept him awake for 12 hours of questioning and finally asked him to give a "vision statement." It required him to describe, hypothetically, what he would have done if he had killed his parents. The police turned that into a confession. In this production at the Royall Tyler Theatre, the acting style was uniformly low-key. Director Gregory Ramos steered the performers to avoid over-emotionalizing, letting the facts speak for themselves. This approach gave the audience the freedom to respond like firsthand observers, not people listening to a lecture. The actors used regional accents to echo the fidelity of a script built from the real words of real people. Ramos added simple, emphatic lines of choreography, putting some or all performers in motion at most story transitions. The show began with a straight line of 10 identical aluminum Navy chairs at the back of the stage; the performers lifted and repositioned the chairs, then sat in unison to reassemble themselves in new patterns around the stage. By using simultaneous movement, Ramos gave the mesh of stories a multilayered, harmonic feel. The ensemble remained onstage throughout, forming a backdrop for a series of riveting, unaffected monologues. All the performers showed a good sense of the audience, instinctively connecting without tugging for viewers' attention. Katherine Reid, as Sunny, was a captivating storyteller who let her character's humor and perspective shine clearly. Subtle and centered, Reid had no need to emotionalize what listeners immediately recognized as powerful. Jolie Garrett, a professional actor, played Delbert, whose poetic musings provide transitions in the story. Garrett's acting craft was sometimes a little too polished for this documentary style, but his skill allowed the play's one emotional eruption to burn with pure heat. As Robert, UVM philosophy professor Randall Harp showed exquisite naturalism in speech and manner. He was supremely comfortable onstage and brought Robert's story to life by owning every moment of it. Ian Walls emphasized David's inner strength, giving him a mysterious solemnity. Ethan Foley did some deep work as Kerry, capturing the character's youthful hope and later defeat. Toby Esposito, as Gary, radiated impenetrable calm to show that a lifetime isn't long enough to understand the unimaginable but does allow one to adapt. In ensemble roles, Brianna Ball, Caitlin Durkin, Michael Daly III and Ian Kimmel played a variety of briskly sketched police, family members and trial participants. Often with only a single line to paint a character, they all did an admirable job of reenacting the flashpoint conditions around the main characters. The production design was austere, suggesting simple dignity but also desolation. Scenic designer Jeff Modereger filled an imposing back wall with conflicting symbols of freedom and imprisonment. On a roughly textured gray wall, three small barred windows hinted at a faraway world outside. Across the wall, a massive American flag was painted with coarse strokes. Lighting designer John B. Forbes kept those high prison windows impossibly out of reach by lighting them with an unreal glow. The back wall was often lit as if dimmed by grime, but Forbes sometimes let light pulse across it to represent an electric chair or washed it with uplights. The sound design by Liam Daugherty started with preshow songs of freedom and youth from the '70s, the period in which several characters were incarcerated. The precision sound effects provided crisp jolts of reality in the stories: Though little was enacted literally, the sound of a gunshot or a rainstorm flooded the theater with the essence of a moment. On the show's opening night, the audience was hushed and rapt but able to acknowledge the little accents of humor that dotted the stories. 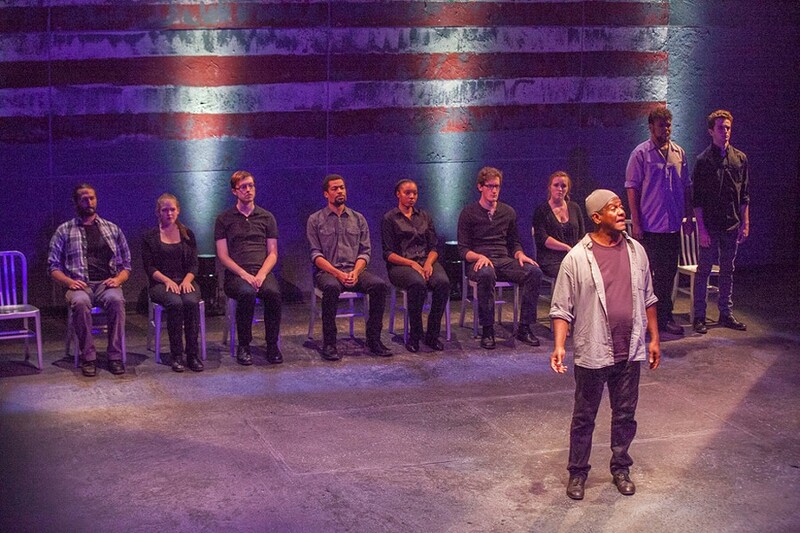 Watching the play is not a grim ordeal, but it does provoke audiences to consider the consequences of America's prison industry and death penalty. The Exonerated doesn't have the shape of drama since the title itself reveals the outcome. Instead, the play captivates by making the possibility of false conviction a quiet little horror story. Combining a documentary perspective with solid, understated performances gives the audience a reason to reflect on a justice system that seems to consider lost years — and lost lives — a cost of doing business. *Correction: October 20, 2017: An earlier version of this story misstated Kerry Max Cook’s relationship to the woman he was falsely accused of murdering. The original print version of this article was headlined "Life, Interrupted"